Do you have a special birthday celebration to prepare for? Do you want this party to be one that everyone remembers as a stylish, classy, above the average gathering with lots of little touches that make every guest feel special and unique? If so, you might want to check out Singapore based site Cardblanche. Their speciality is exquisite wedding stationary, but they have recently branched out to party favours and stationary. 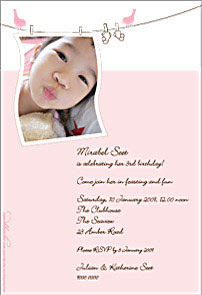 So if you are hosting a baby shower, a birthday party, a wedding, or in fact any special event, this company do beautiful invitations, announcement cards and door gifts, and goody bags at reasonable prices (party invitations start at SG$1.80 each including matching envelope). At the Cardblanche website, there are lots of gorgeous designs, colour schemes and texts to choose from, which all make it very easy to personalise your stationary or gifts in a few simple steps. You can also personalise the party favours and design your invitations in the form of the chocolate bar label, or mint roll label, for example. This is a very classy and fun way to invite your friends to your party. Plus they get to eat the chocolate or candy! 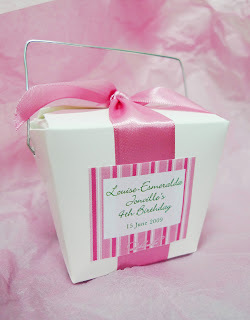 The party favour packaging is very cute (look under 'fun stuff' on website). One of my favourites is the Chinese take-out box, pictured above, which comes with pretty ribbon and sticker of your choice. You can fill it with your own goodies or choose from Cardblanche's. Allison, from Cardblanche, says they do all sorts of parties, from baby showers, sweet sixteen parties, to surprise parties. She recently worked on a girl's 16th birthday party with about 80 guests. 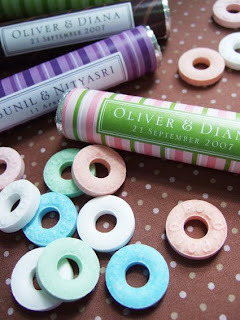 They used the mint rolls for her, customised with her name and birth date. They usually have a minimum order of 50 pieces but for certain items, they are able to do less. For a recent child's party, the mother ordered 35 takeout boxes and bought her own sweets which Cardblanche then packed. Each takeout box with the ribbon and sticker costs $3.40 and 50cents to pack. So for a special event , there are a number of ways you can use a service like Cardblanche to jazz things up. Give your guests a unique invitation, a special door gift or a little momento they can keep to remember the event. For more information, please go to Cardblanche website.